De-ices windscreens. Cleans windscreens without smears. 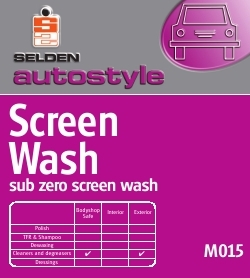 Prevents windscreen washers freezing in winter conditions. Cleans windscreens without smears. Prevents freezing in winter conditions. Used by garages, motor pools, haulage contractors, minicabs, taxis, Public Authority Vehicles, buses etc. For deicing: Use undiluted. Pour or spray onto area as required. Leave for about 5 minutes until the ice has liquefied then brush clear. Summer Use: Dilute 1 part product to 40 parts cold water and pour into washer tank. Winter Use: Dilute 1 part product to 10 parts cold water and pour into washer tank. Severe Winter Conditions: Dilute 1 part product to 1 part cold water and pour into washer tank.